What would the ultimate credit card look like? What features would it have? 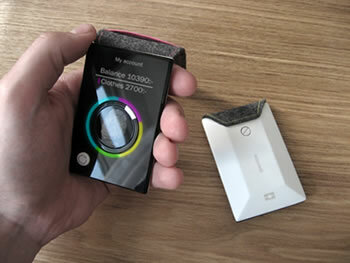 Designer Jacob Palmborg takes his best shot with this iPod-like device that is connected to all of your accounts. His concept (this is only a design; it's not even a prototype) uses what appears to be an iPod-like interface to choose between different accounts. It has a display that constantly updates you on your financial health. The wireless device uses biometric security to make sure that you are the only person who can use it. It also provides you with a forecast of your financial future, based on the purchases you are about to make (see additional photos). As it happens, this kind of implanted card is already being tried; there is a Baja Beach Club Implanting VeriChip In Customers. The VeriChip is a RFID tag small enough to implant just under your skin; it accesses the Veripay payment system. The ultimate expression of credit cards might be the universal card used in the future worlds of Dan Simmons' 1985 novel Hyperion. Interestingly, if you try to consult any of the credit card industry oracles, the only really new thing they see on the horizon is the contactless smart card that uses RFID chips and merchant RFID readers to let you just wave as you walk by with your purchases. Read a bit more at Yanko Designs.